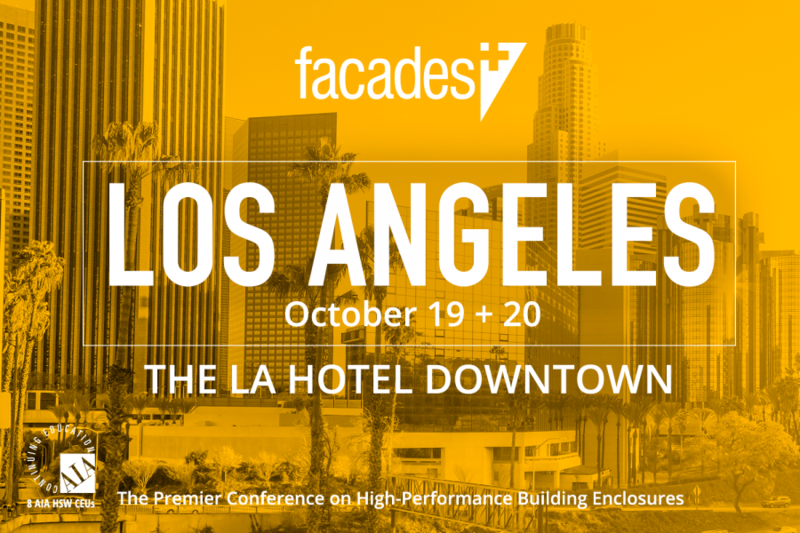 Returning to downtown Los Angeles on October 19 and 20, the Facades+ Conference will unite top professionals from the worlds of design, fabrication, and construction to consider how high performance envelopes contribute to and are shaped by L.A.’s unique architectural landscape. As a conference media sponsor, the LA Forum talked to Marty Wood, Program Director of the Facades+ Conferences, about finding a community of “facade geeks” and the building industry at large. What are the goals and themes of the Facades+ L.A. conference? The Facades+ Conference is now approaching six years in existence and continues to grow and evolve. The conference series started with the emphasis on building envelopes from many perspectives: material, technique, design, and sustainability. We’ve had a dedicated group of “facade geeks” who continue to return to these events, year after year, and we continue to share our passion for buildings with new audiences. Performance and sustainability is always an overriding theme of the conferences and many of the experts we bring together reflect that shared goal. We’ve tailored this year’s Los Angeles event in partnership and with the guidance of SOM’s Design Directors Paul Danna & José Luis Palacios and Senior Technical Designer Garth Ramsey, to create what we hope is a compelling program for Los Angeles’ many building professionals. We want to create an environment where architects, engineers, construction leaders, and other building professionals can meet each other, network, learn, and exchange ideas. What talks and events are you looking forward to? We’ve got a stellar lineup of presenters this year from many of Los Angeles’ award-winning architecture firms. Our keynotes are Stanley Saitowitz in the morning and Julie Eizenberg & Nathan Bishop of Koning Eizenberg in the afternoon. Alice Kimm (JFAK) and Lorcan O’Herlihy will also be presenting their studios’ excellent work. Our panel conversations feature issues of political importance such as designing supportive housing and innovative research from scholars at L.A.’s top universities. Other panels include high-profile civic projects such as the new Federal Courthouse and L.A.’s upcoming stadium developments. The Facades+ conference has expanded to multiple cities in recent years. How does the Los Angeles iteration of the conference differ from ones held in other cities? Since Los Angeles is one of the U.S. hubs of architecture and design (and with so many active construction projects), we are always excited to come back here. Each Facades+ event is different because we partner with local firms to develop the program and tailored to local audiences. We love Los Angeles and have made it one of only two of our yearly two-day Facades conferences. The expanded format offers not only the full day symposium and exhibitors gallery, but a second full day of deep-diving workshops led by experts on topics as diverse as NetZero and sustainable design, ETFE, detailing for facades, and software such as Processing and Dynamo. It’s a great way for architects to learn new skills, network and take care of their AIA required credits. We hope to see you there!